First, define the target audience for the new employee certification tracking program. The reasons may vary. It can be new equipment that requires training and certification or, you may want to boost general productivity and set higher work quality. People rarely come to you fully trained for the needs of your company, so you can use the training and certification workflow processes to get exactly what you want from you personnel skills. The process unites the main steps of employee certification tracking, including certification request, supervisor approval, training, testing and retesting. 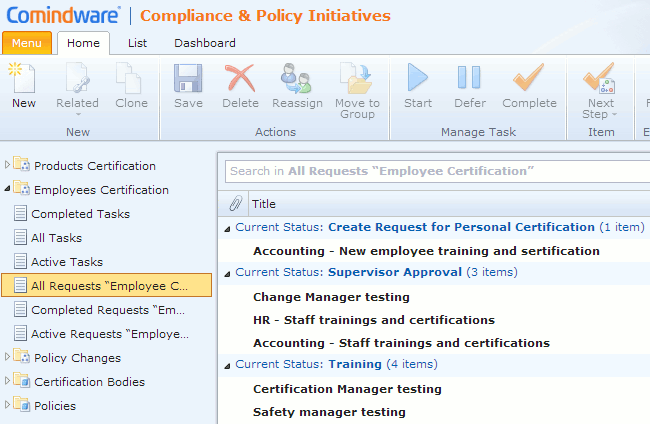 The lists give the picture of all certifications at a glance and they can be also seen in the form of dashboards. The solution is fully customizable so that you can add approval or assessment steps to make the process reflect your business policies. Our employee certification tracking and automation software solution is ready for use by a training manager and the department supervisor. All you need to access it for a free 30 day trial period is getting your credentials here.